There are eight herbal supplements that should be in your medicine cabinet during cold and flu season. 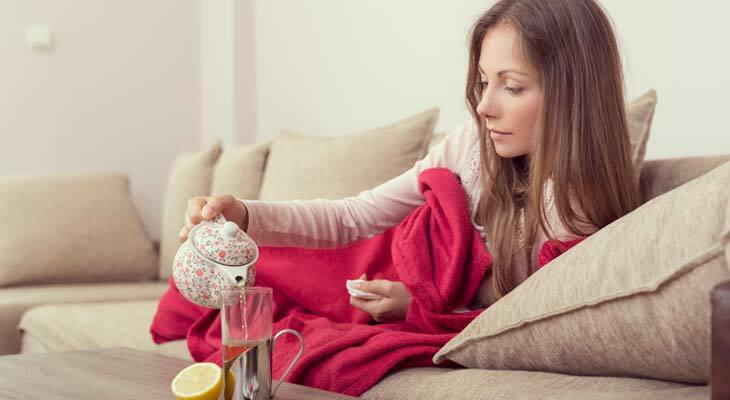 Read on to learn what to take to beat a cold or the flu the natural way. You don't have to hibernate all season long to stay well. There are herbal remedies shown to possibly prevent the common cold or flu and/or shorten your healing time when taken properly. Best of all, they won't leave you feeling groggy. Olive Leaf -- Working within the body like a natural antibiotic, olive leaf (Olea europea) can help fight infection to speed recovery. Echinacea -- Known for its immunity-boosting effects, echinacea (Echinacea angustifolia) can be taken both as a preventative measure and to help the body fight infection. Calendula -- If you suffer from a sore throat, calendula (Calendula officinalis) has anti-inflammatory, antibacterial and antiseptic properties. Myrrh -- Another remedy for a sore throat, myrrh (Cammiphora myrrha) also has antiseptic and anti-inflammatory properties to provide relief. These herbs can be taken on their own or in a combination. They aren't known to interfere with any cold medications at this time, but if you're currently on prescription or over-the-counter (OTC) medications for another medical condition or are pregnant or breastfeeding, you should consult your doctor first. Ginseng -- While American ginseng (Panax ginseng) may be known for giving you energy, it may also help prevent infections like the flu. Boneset -- If you're battling a fever, consider taking some boneset (Eupatorium perfoliatum) to bring your temperature down and also improve respiratory issues. Andrographis -- Although commonly used to treat upper respiratory infections, andrographis (Andrographis paniculata) has also been shown to shorten recovery time from the flu. Eldberberry -- Taken at the first sign of illness, elderberry (Sambucus nigra ssp. canadensis) strengthens the immune system and cleanses the body. There also aren't any known interactions between these herbs and flu medications, like Tamiflu. However, take the same precautions previously mentioned if you have a medical condition or are pregnant or nursing. Stay hydrated, drinking at least eight 8 fl oz glasses of water per day. Make sure you're getting your daily recommended vitamin C, vitamin D and zinc for immune system support. Always wash your hands before and after meals, after touching your keyboard at work and before and after touching your eyes, nose or mouth. Carry hand sanitizer with you at all times. Rest when you're first getting sick to avoid prolonging illness or passing it on. Try to eat as best you can when feeling sick -- don't starve a cold or a fever. These practices will help you feel your best this season no matter who or what you run into. Shop for everything you need to stay well at eVitamins! If there's one supplement to keep in your cupboard this winter, it's olive leaf. This product provides 500 mg of olive leaf extract plus echinacea and the antioxidant mineral selenium. Mix up a glass of this delicious extract with water as soon as you feel a cold or the flu coming on to strengthen your immune system. This pure extract contains no additives.